The holidays are right around the corner! Finishing final exams, coordinating Christmas plans and stuffing your face full of mom’s homemade food (finally!) can be exhausting. It’s pretty tempting to shrug off the big/little gift exchange before the semester ends and promise to do it once classes start up. Finding the perfect present can be a challenge, and pushing off a gift exchange can make the struggle even harder. So here are Beta Xi’s top suggestions for presents will thrill any big or little. Happy gifting! This gift is perfect for any busy sorority girl. The to-do notepad is the best place to help your big or little keep track of her assignments, volunteer schedule, meetings or daily errands. She will thank you a million times over for finally having a single place to write down all of the little things that are on her plate. Tell your big or little you really love her with an engraved bracelet. Although it may sound cheesy, personalizing the engraving can really be the perfect touch. A woman in Beta Xi bought her big a bracelet engraved with the date of their big/little reveal. It was so precious and put a smile on her big’s face instantly. Turn those ideas for big/little dates into a reality with “date night” coupons. Create one coupon for every month of the semester with an activity that gives you and your big something priceless: time together. Have you both been meaning to try that new froyo place or do you love bowling but never seem to have the time to go? These cards are a great way to make time for one another during a busy semester. Nothing says I love you more than something homemade. If you’ve never tried, making a homemade letter shirt for your big or little can be so much fun. Digging through all the fabric options to find something that will match her personality at JoAnn Fabrics is just as fun as her opening the gift. There are plenty of patterns and tutorials online of how to make the shirts. And whether you sew her shirt on a machine or by hand, she will definitely think of you every time she wears it. Has your big or little donated to Alpha Xi Delta’s Undergraduate Giving Challenge yet? The Undergraduate Giving Challenge is a way for undergrads to give back to Alpha Xi Delta and donate to her Foundation. Those who donate $18.93 or more to the Foundation will join the Heart Sunshine Circle and receive a special Quill dangle. So make a donation in her name and give her the dangle as a surprise. 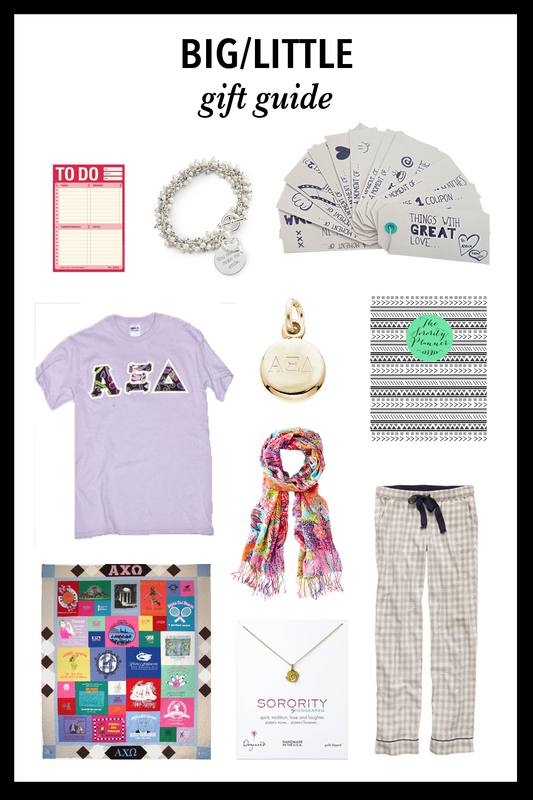 This is a no brainer gift that not only benefits Alpha Xi, but gives your big or little something to brag about. Is your big or little a meticulous planner who loves to write down just about everything? Then the Sorority Planner is the perfect gift for her. Not only does the planner offer a full calendar for each month and ample amount of room to write down daily assignments, but this planner even includes sections for chapter meetings, committee meetings and even event planning. Planners can even be customized to include a section for e-board meetings. Perfect for all seasons, a Lilly never goes out of style. Snoop and find out which print is her favorite. Ambitious? Yes. Worth it? Totally yes. T-shirt quilts are perfect for any big or little that has a ton of t-shirts and appreciate anything sentimental. This gift turns her memories into something practical she can use or display with pride. Get ready for tons of Instagram photos and maybe even some tears. Dogeared makes a beautiful gold rose necklace. It’s small and dainty without being too flashy. She will definitely appreciate this piece of jewelry that goes with nearly every outfit. Whether she’s bumming around in the house or studying in her dorm room, every big or little needs an extra comfy pair of pj bottoms. Get her a pair that matches her favorite letter shirt or sweatshirt and she will be in love! This entry was posted in Beta Xi Posts and tagged big, bracelet, coupon, date, dnagle, engraved, gift, Heart Sunshine Circle, homemade, letter shirt, Lilly, Lilly Pulitzer, littl, necklace, night, notepad, pajamas, pjs, planner, present, quill, quill dangle, rose necklace, scarf, sorority planner, to-do, Undergraduate Giving Challenge. Bookmark the permalink.